Until this past week Sideswipe was the only Columbus brewery that had neither a taproom nor a brewpub. To get your hands on their beer you had to make a trip to a local store and pick up a bomber adorned with one of their distinctive splatter art themed labels. I respect them for taking that route because the availability of bottles or cans gives you so many more options of when and where you can enjoy the product. Still I love visiting the taprooms of small breweries, so when Sideswipe announced that they were opening a taproom this past Thursday (June 26, 2014) I made plans to be there for the grand opening. I was joined by my friends Ralph, Mark, Hans, Tim and Nick. A tasting flight of Sideswipe magic. The brewery and taproom are located in an industrial space on the west side of Columbus, not too far from where I-670 splits off from I-70 (2419 Scioto Harper Drive, Columbus, OH 43204). It has a classic nanobrewery tap room vibe, with a big garage door that opens up to reveal a large rectangular room. There is a make-shift bar set up about one-third of the way into the room, adjacent to the walk-in refrigerator where the kegs are stored. The brewing equipment is located in the space behind the bar, while there are a couple of bar tables, along with a few folding tables and chairs set up in the front of the bar. 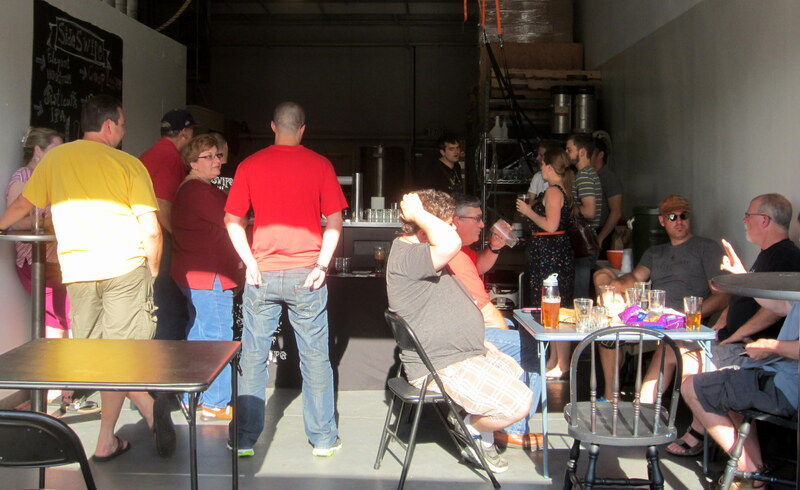 The layout is not so different from the Zaftig taproom (sans couches and a television), which I reviewed back in April. On this glorious June evening there were about twenty people in total soaking in the casual atmosphere and sampling some tasty beer. If you’ve been reading my reviews of local beers you’ll know that I’ve been impressed with Sideswipe. They only brew four beers—Coop Looter Saison, Fisticuffs IPA, Elegant Hoodlum Smoked Stout and the newly released Pixelated Sun Hoppy Wheat—but they do those beers very well. 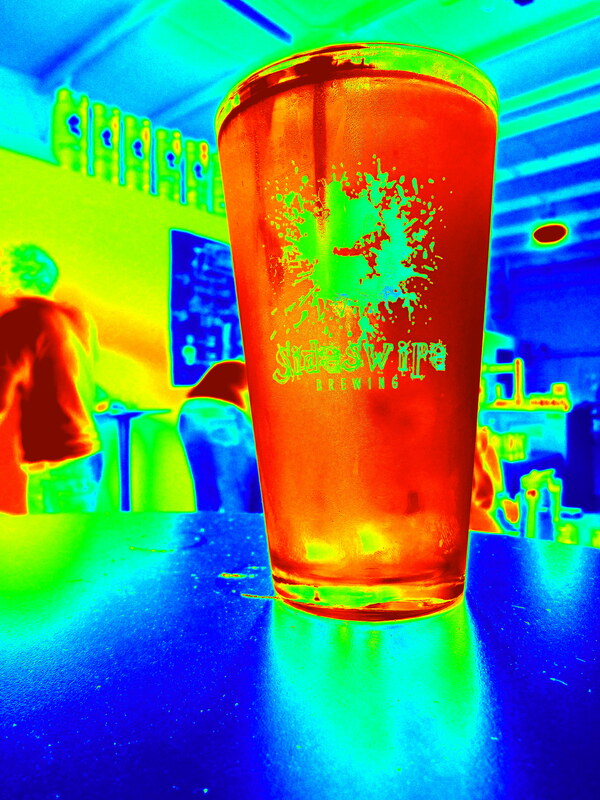 All four beers were available at the taproom either as a 4 oz sample for $2 or as a pint for $5. 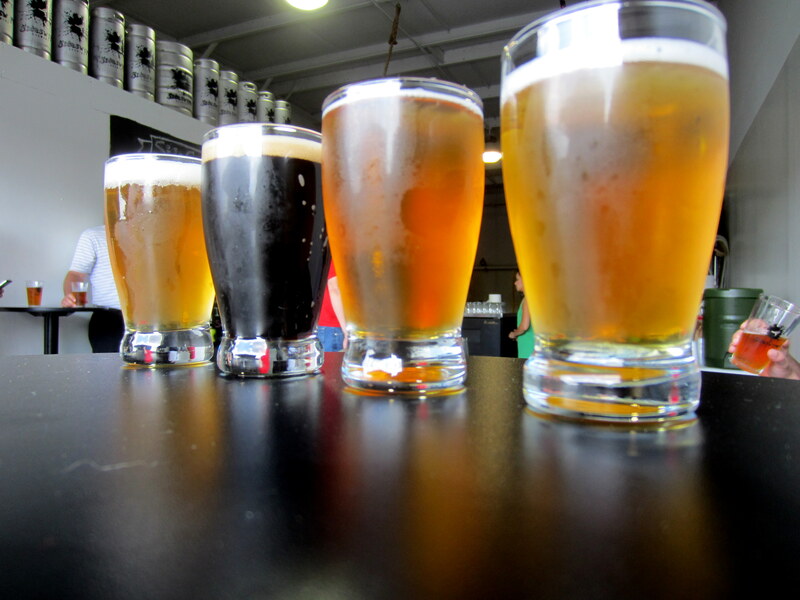 If you are unfamiliar with Sideswipe beers here are my brief tasting notes on each. Fisticuffs IPA – Flavors of citrus and pine from the hops balanced with some caramel from the malts, perhaps a shade maltier than your average West Coast IPA. There is a touch of aromatic fresh green hop aroma on the nose, and the mouthfeel is just resinous enough to let you know it’s an IPA. Pixelated Sun Hoppy Wheat – This was the first time I’ve had a chance to try this recently released beer. It’s very hop forward and my first impression is that it’s not so different from Fisticuffs. Pixelated Sun has a brighter more citrus leaning hop profile and the malts are dialed back a little compared to Fisticuffs. The contributions of the wheat are not so easy to pick out, the beer is clear rather than hazy and the head doesn’t seem any more voluminous than the other Sideswipe beers. Still it has a crisp, easy drinking summer IPA type vibe to it, making it a good choice as we move into the dog days of summer. Getting a chance to meet and talk to the brewer is one bonus that you can’t get at the local beer store, and I was happy for the chance to meet the main man at Sideswipe, Craig O’Herron. I know from the Sideswipe website that Craig is an accomplished martial artist, who spent time in Asia and has a black belt in Thai Kickboxing. For me that conjures images of someone with an intense stare and a dragon tattoo on his face, and since he is a brewer we might as well throw in a hefty beard and a baseball cap. If there were a trading card game for brewers his card would be highly sought after. Not surprisingly my crudely conjured stereotype was way off the mark. Craig is friendly, but soft spoken and not much bigger than me. He was dressed in a black Sideswipe Brewing t-shirt and khaki shorts, hat-less with a light dusting of facial hair, but not nearly enough to be invited to jam with ZZ Top. Despite his mild mannered appearance I have no doubt that he is about 2000% stronger, tougher and quicker than me. So no matter how many pints of Fisticuffs IPA you put away when visiting the taproom remember to behave yourself lest Craig has to demonstrate his proficiency with a cobra punch. I asked Craig what beers he had planned for the future and he told me that he is planning on putting out a pumpkin beer in the fall, one that tastes more like a beer than a pie. He plans to use more squash than pumpkins, because apparently squash gives more pumpkin flavor in a beer than actual pumpkins. Who knew? Sign me up for a bottle when it comes out. 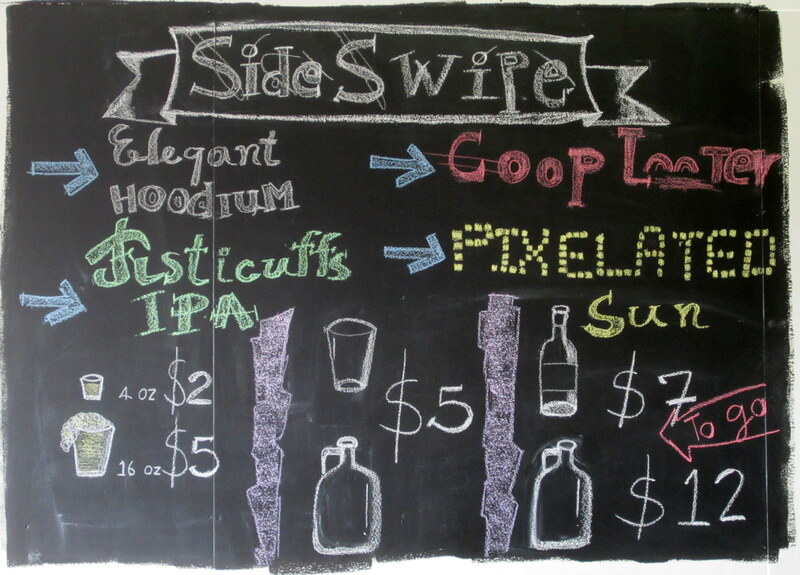 In summary, the Sideswipe taproom is well worth a visit if you enjoy the casual atmosphere, fresh beer and fair prices. Sideswipe is still a pretty small operation so the beers on offer are the same ones you can buy at the store. The main attraction is to get a better sense of where your beer is coming from and to hang out with other people who love beer. They are located not far off of the Scioto trail which make them accessible on a bike. In fact Mark, Hans and Nick all made the journey out to the taproom via bicycle. The distance from my house in Clintonville is about 9 miles each way so I hope to make that journey sometime later in summer. After that journey I’m sure a pint of Pixelated Sun will be just what the doctor ordered. They are only open on Thursdays from 5-9 pm, so plan accordingly. It was great until 6… After 6 it was a hell on earth. Too many people and not enough restrooms. We were able to taste the IPA… And meet his parents at DIGfest. Both were delightful. Craig seems like a classy guy, so it’s not surprising to hear that his parents are good people. We were out of town for DIGfest. How was it?